These past six months or so, I’ve really been getting a lot of use out of my library card. Ever since I signed up for Library Elf, that wonderful service that sends out reminder emails about books coming due or overdue, I’ve even managed to keep my library fines down to a minimum (you don’t want to know about the arm and the leg I paid to my library before I discovered Library Elf – and I have no excuse, not really, because there’s a branch of the library within a few blocks of my house). I discovered a few months ago that my library offers monthly newsletters that feature their latest acquisitions in a variety of genres. I’ve signed up for several of these newsletters, and always look forward to getting these emails – I’m always sure to add a few more holds to my library account. Yesterday came with a flurry of these emails. The books listed in them aren’t necessarily new releases – often they are just “new to us” acquisitions. And of course, I placed several holds! 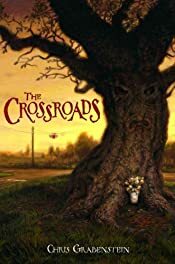 The Crossroads, by Chris Grabenstein. I’m not sure why this showed up in the new books for teens newsletter, actually, as I’d already borrowed it once previously (but then got stuck under an avalanche of deadlines and had to return it unread). It’s by Chris Grabenstein, who writes the John Ceepak mystery series for adults, which I really enjoy. Zack, his dad, and new stepmother have just moved back to his father’s hometown, not knowing that their new house has a dark history. Fifty years ago, a crazed killer caused an accident at the nearby crossroads that took 40 innocent lives…. 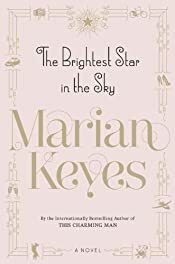 The Brightest Star in the Sky, by Marian Keyes. I think I’ve read one Keyes novel in the past – I seem to remember I enjoyed it. The storyline in The Brightest Star in the Sky sounded very intriguing. Since Keyes is such a popular author, it will be a while before I get my hands on this one. The Brightest Star in the Sky follows seven neighbors whose lives become entangled when a sassy and prescient spirit pays a visit to their Dublin townhouse with the intent of changing at least one of their lives. But what will this metamorphosis be and who will the sprite choose? 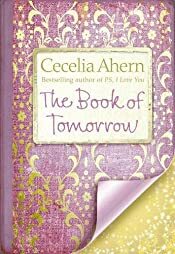 There’s Matt and Maeve, the newlyweds struggling to overcome the first obstacle in their storybook romance; Lydia, the brassy but vulnerable cabbie; Katie, the just-turned-forty PR executive searching for a more gratifying life; and the eldest resident, Jemima, currently playing hostess to her son Fionn, who is in town to star as the hunky gardener in a hot new television show. Tamara Goodwin has always got everything she’s ever wanted. Born into a family of wealth, she grew up in a mansion with its own private beach, a wardrobe full of designer clothes, a large four poster bed complete with a luxurious bathroom en-suite. She’s always lived in the here and now, never giving a second thought to tomorrow. But then suddenly her dad is gone and life for Tamara and her mother changes forever. Left with a mountain of debt, they have no choice but to sell everything they own and move to the country to live with Tamara’s Uncle and Aunt. Nestled next to Kilsaney Castle, their gatehouse is a world away from Tamara’s childhood. With her mother shut away with grief, and her aunt busy tending to her, Tamara is lonely and bored and longs to return to Dublin. When a travelling library passes through Kilsaney Demesne, Tamara is intrigued. She needs a distraction. Her eyes rest on a mysterious large leather bound tome locked with a gold clasp and padlock. With some help, Tamara finally manages to open the book. What she discovers within the pages takes her breath away and shakes her world to its core. 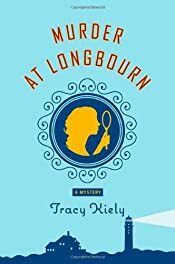 A die-hard fan of Jane Austen novels and the traditional English mystery, Tracy Kiely has combined elements of both for this truly delightful and witty debut. Planning New Year’s resolutions to rid her life of all things unhealthy, Elizabeth Parker has dumped fatty foods, processed sugar, and her two-timing boyfriend. Indeed, the invitation to join her Aunt Winnie for a How to Host a Murder Party on New Year’s Eve at Winnie’s new Cape Cod B and B comes just in time. But when the local wealthy miser ends up the unscripted victim, Elizabeth must unearth old secrets and new motives in order to clear her beloved aunt of suspicion. 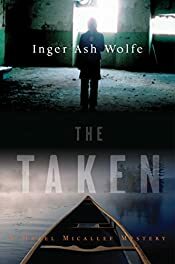 The Taken, by Inger Ash Wolfe. This is the sequel to The Calling, which I haven’t read yet either – a copy of The Calling is available on the shelves, so I’m going to get a hold of it and get it read before this hold on The Taken comes my way. It was actually the summary of The Calling that made me decide to give this series a try. Detective Inspector Hazel Micallef has lived all her days in the small town of Port Dundas, Ontario and is now making her way toward retirement with something less than grace. Hobbled by a bad back and a dependence on painkillers, and feeling blindsided by divorce after nearly four decades of marriage, sixty-one-year-old Hazel has only the constructive criticism of her mother (the former mayor) and her own sharp tongue to buoy her. But when a terminally ill woman is gruesomely murdered in her own home, Hazel and her understaffed department must spring to life. And as one terminally ill victim after another is found, Hazel finds herself tracking a truly terrifying serial killer while everything around her spins out of control. Through the cacophony of her bickering staff, her unsupportive superiors, a clamoring press, the town’s rumor mill, and her own nagging doubts, Hazel can sense the dead trying to call out. Will she hear them before it’s too late? Detective Inspector Hazel Micallef is having a bad year. After major back surgery, she has no real option but to move into her ex-husband’s basement and suffer the humiliation of his new wife bringing her meals down on a tray. As if that weren’t enough, Hazel’s octogenarian mother secretly flushes Hazel’s stash of painkillers down the toilet. It’s almost a relief when Hazel gets a call about a body fished up by tourists in one of the lakes near Port Dundas. But what raises the hair on the back of Micallef ’s neck is that the local paper has just published the first installment of a serialized story featuring such a scenario. Even before they head out to the lake with divers to recover the body, she and DC James Wingate, leading the police detachment in Micallef ’s absence, know they are being played. But it’s not clear who is pulling their strings and why, nor is what they find at the lake at all what they expected. It’s Micallef herself who is snared, caught up in a cryptic game devised by someone who knows how to taunt her into opening a cold case, someone who knows that nothing will stop her investigation. This entry was posted in Books and Reading and tagged general fiction, ghost stories, library, mysteries, to be read, young adult on January 17, 2010 by Belle Wong.